Client’s Vision: We were contacted by this client to design a home office. Our client had worked in Corporate America and was moving to a new job that enabled her to work from home. The office she had at home was an uninspiring space and she desired a functional, feminine, beautiful work space where she could entertain clients from time to time. Her desk was floating in the middle of the room and the cables for computer, mouse, printer and other devices were laying loosely on the floor. It was both aesthetically unpleasing and dangerous. 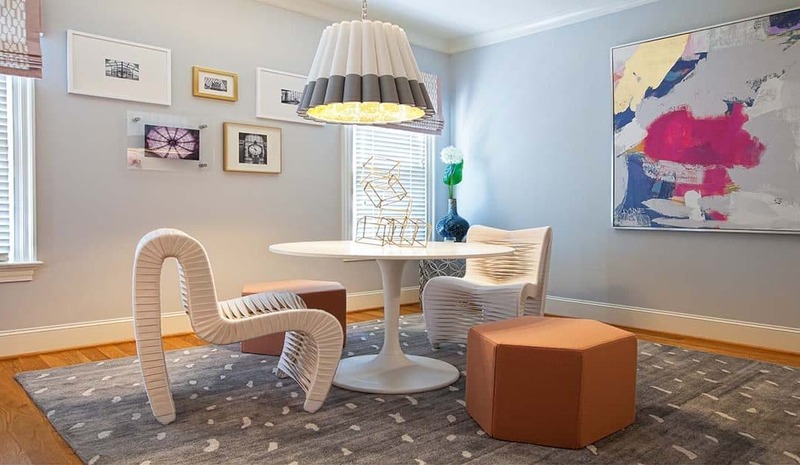 Her current furniture layout did not allow for any type of table where she could hold meetings with clients. The color scheme was brown, green and beige and my client hates green and brown! I always like to start by asking my clients which pieces of furniture they are attached and which ones we can get rid of. 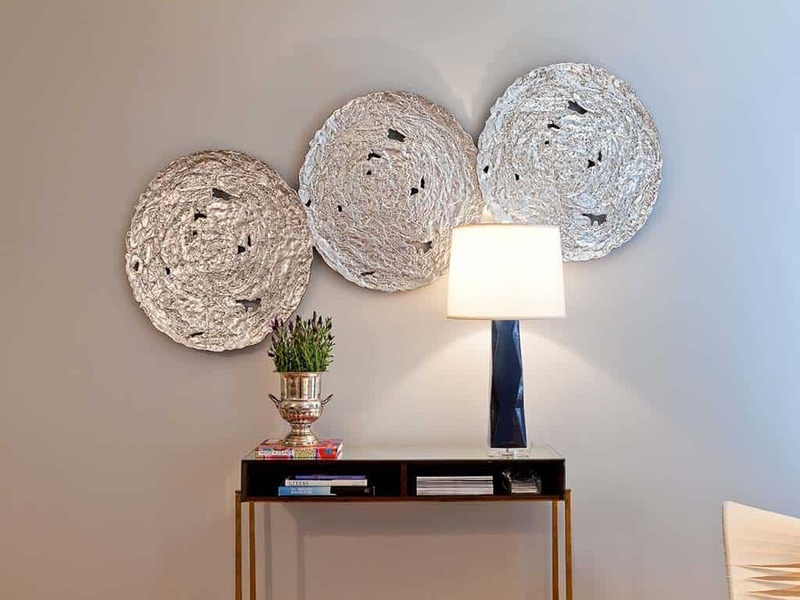 Some pieces in a room have sentimental value or sometimes the budget just doesn’t allow for brand new everything in a room. These are two very valid reasons to keep some of your furniture, it will just be a matter of making them work for your new, redesigned space. Make a list of things you want to keep in your space and let the rest go! I also like to ask my clients to go on Pinterest, Houzz or simply through magazines and find images they find visually compelling and are attracted to. It is the big picture you should be looking for: general design style, layout, color schemes, furniture or accessories you find aesthetically pleasing. Visuals give us designers an idea of what the desired look is, even if you are unable to put it in words. Defining your style and what you like is the most important step in the design process! Our client did her homework and created a Pinterest board with images she loved and inspired her. 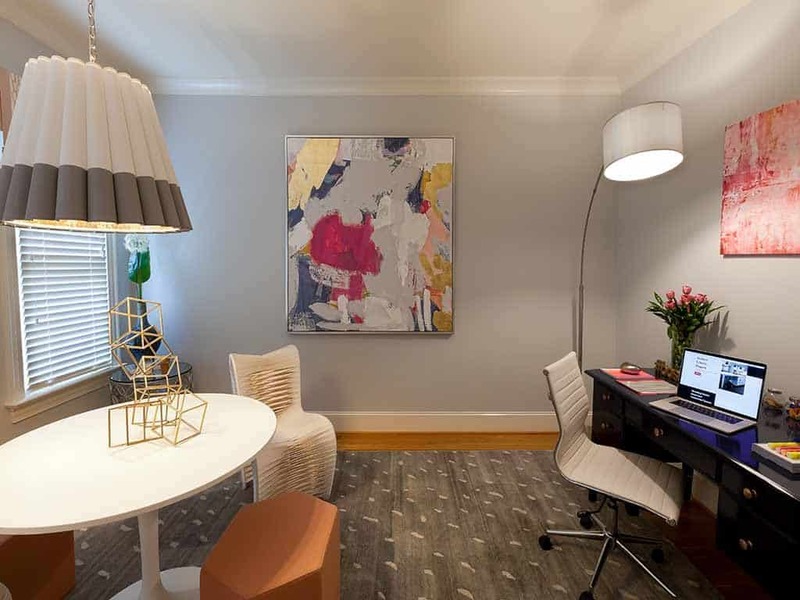 After analyzing the board together, we decided that her desired look for this office was a modern, minimalist space in a soft, neutral color palette but with added pops of color. The room had to be highly functional but also soft, feminine and fun at the same time. Well, to me, Form follows Function… Don’t misunderstand me, I love beautiful spaces, but unfunctional beautiful spaces are a complete waste! This means that you must first decide how your space should work for you. Ask yourself who will be using this space and how this space will be used. What tasks will be performed? What are the technical requirements for them? Are there any other requirements for the space? 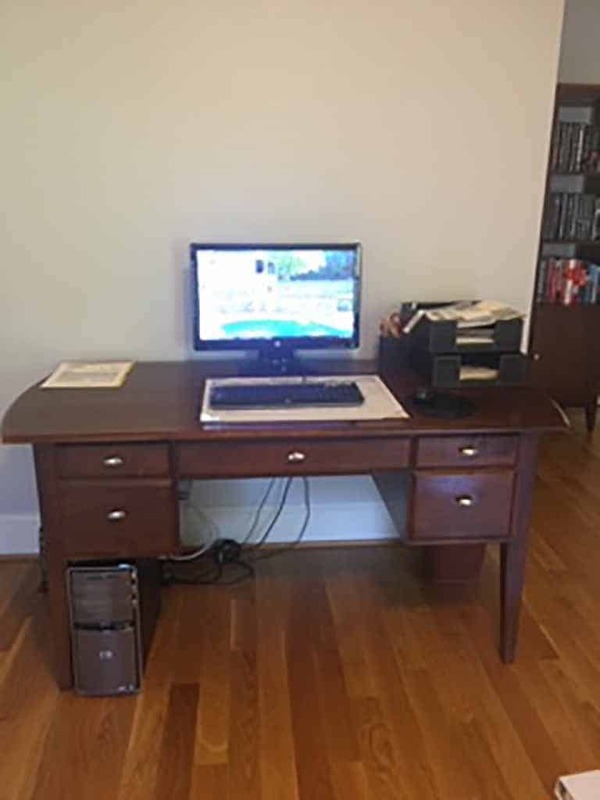 For our client, a desk with a hard drive computer and printer were a must as well as an area for small client meetings. Less cables and wires, good task lighting and mood lighting were desirable features. Once you have a list that outlines what works and does not work in your space, set out to fix these issues. In our space, we started by moving the desk and placing it facing one of the walls as opposed to floating it in the middle of the room (this was the layout that our client had). We purchased a wireless printer and hid in the closet and added a wireless mouse to the mix. This got rid of some of the cables and streamlined our design. By placing the desk facing the wall, we made enough space in the room for a small conference table and chairs and other pieces of furniture that were needed to complete the space. And yes, we did say goodbye to the brown, beige and green color scheme! Pick a piece of furniture, a work of art, a wonderful fabric, an accessory or any object that inspires you and base your design on it. 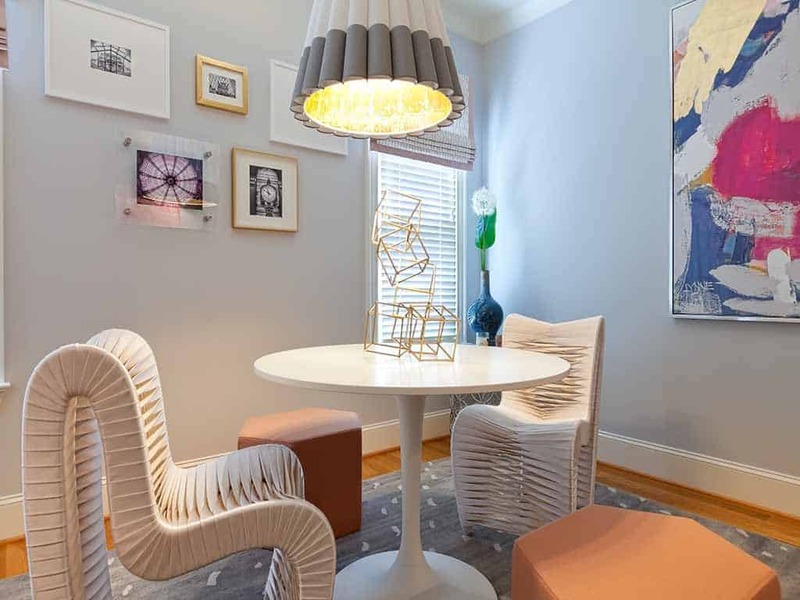 My client and I purchased a beautiful large-scale work of art in a neutral color scheme with pops of blue, hot pink, blush pink and we let this element drive the rest of the design. From then on it was easy. We painted the room in a light grey with a hint of lavender, had the desk refinished in a navy-blue paint color and paired it with a slightly patterned, soft, light grey area rug. We picked a modern white round table and funky, comfortable chairs along with some fun shaped versatile ottomans to create the “conference area”. We topped the space with a sculptural brass console table with a mirrored top, a modern floor lamp, an amazing chandelier and fun artwork. Outcome Achieved: A functional, modern, feminine space that perfectly reflects my client’s personality. 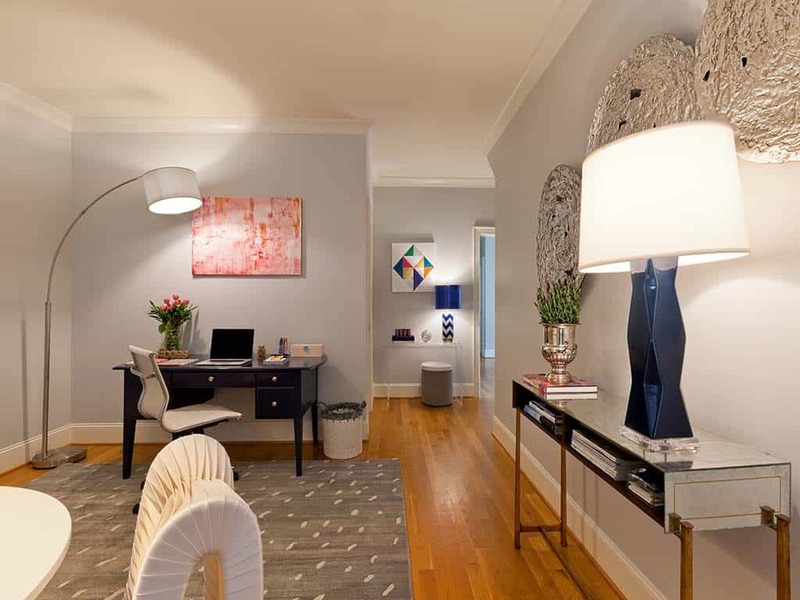 Create a work space that reflects YOUR design aesthetic and one that inspires and motivates YOU! Decorating a home office does not have to be an overwhelming task.Thinking about remodeling your work space? Gives us a call!